More clarity, more detail with Full HD Experience the exquisite detail, contrast and texture of Full HD 1080p. With an image resolution of 1920 x 1080 pixels, Full HD provides five times more detail than a standard definition picture. Everything you watch is sharper, more defined and more real with minimal noise and maximum impact. Rediscover every detail with X-Reality™ PRO X-Reality PRO picture processing upscales every pixel for exceptional Full HD clarity. As frames are analysed, each scene is matched with our special image database to refine images and reduce noise. See how the architecture in the building is enhanced with extra detail. 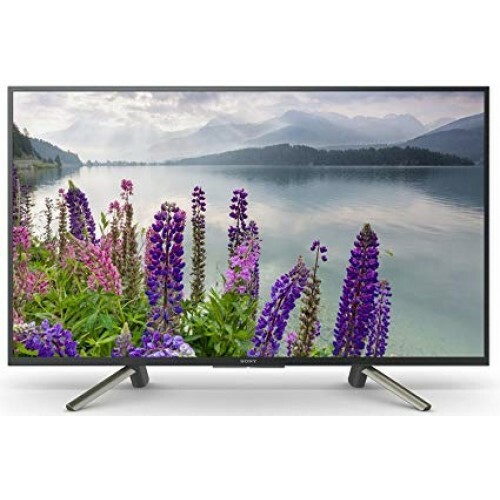 Discover thrilling HDR entertainment This TV brings you the excitement of movies and games in vividly detailed HDR. It handles a variety of HDR formats, including HDR10 and Hybrid Log-Gamma. Explore new worlds with Android TV™ Your smart TV just got smarter. Enjoy many of your favourite smartphone and tablet experiences on a big, beautiful BRAVIA™ screen. Android TV™ with advanced voice control lets you connect and access content, from movies and TV shows to thousands of apps, simply by talking. Narrow aluminium look frame The screen is edged with a slim, narrow frame that maximises the viewing area. Its aluminium effect makes the TV look elegant and refined.